This bilingual book for children is now available for the first time in a paperback edition. Who says that Lupita is “too little?” Not Chief Cobb, the friendly policeman. Not Mrs. Foote, the local gas-station owner. Not even Mr. Grabb, the strange new visitor to town. 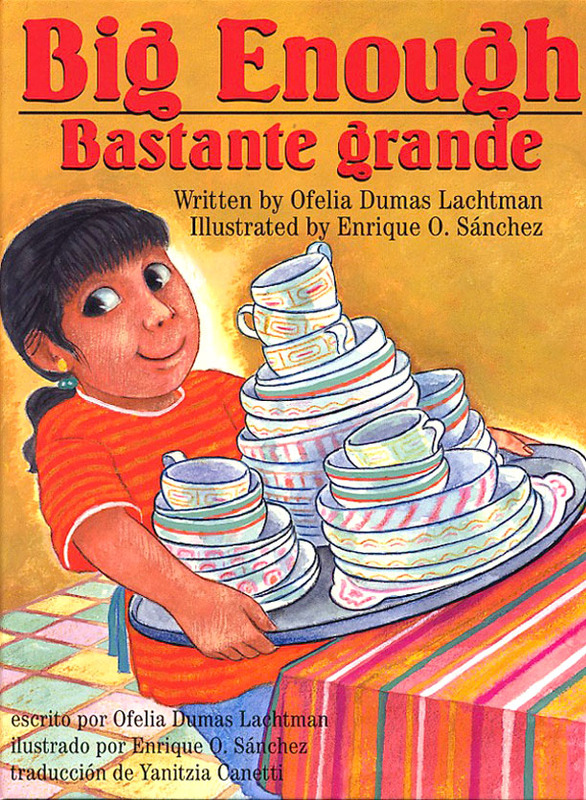 But in Big Enough / Bastante grande by award-winning author Ofelia Dumas Lachtman, Mamá always sighs, “Muy, muy chica,” every time Lupita tries to help out at the restaurant that Mamá runs all by herself. And yet, when push comes to shove—or, in this case, when Grabb comes to swipe—everyone in this bilingual tale for ages 3 to 7 discovers that, although Lupita may be too little for some tasks, for others she is big enough. OFELIA DUMAS LACHTMAN was born in Los Angeles of Mexican-immigrant parents. She is the author of several bilingual picture books, including Big Enough / Bastante grande (Piñata Books, 1998), and five other books in the Pepita series: Pepita Packs Up / Pepita empaca (Piñata Books, 2005); Pepita Finds Out / Lo que Pepita descubre (Piñata Books, 2002); Pepita Takes Time / Pepita, siempre tarde (Piñata Books, 2000); Pepita Thinks Pink / Pepita y el color rosado (Piñata Books, 1998); and Pepita Talks Twice / Pepita habla dos veces (Piñata Books, 1995). ENRIQUE O. SÁNCHEZ is a painter and illustrator. Born in the Dominican Republic, he now divides his time between homes in Maine and Florida. He is the illustrator of numerous picture books for children, including the award-winning Abuela’s Weave (Lee & Low Books, 1993) and Confetti (Lee & Low Books, 1996).